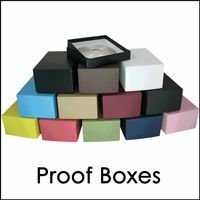 Wildcat's Photo Proof Boxes are an economical, yet professional, way to package and present 4x6 proofs to your clients. We make the boxes right here in Avon, Ohio. Made in the U.S.A.! Wildcat stocks huge inventories of 4x6 photo presentation boxes in a variety of vibrant colors. Our large inventory allows us to pass volume quantity discounts on to our customers. Browse these categories under "Photo Proof Boxes"